In all honesty, it has been a bit of a go slow week! Day 215 – A quiet day at home, didn’t really take any pictures except this one of Bee with an envelope on her head! Day 216 – Hubby was off from work so dragged him to B&Q to check out paint for Munchkin’s room. I think he is on the verge of banning me from going as everytime I go I buy a plant and/or pot of some sort. 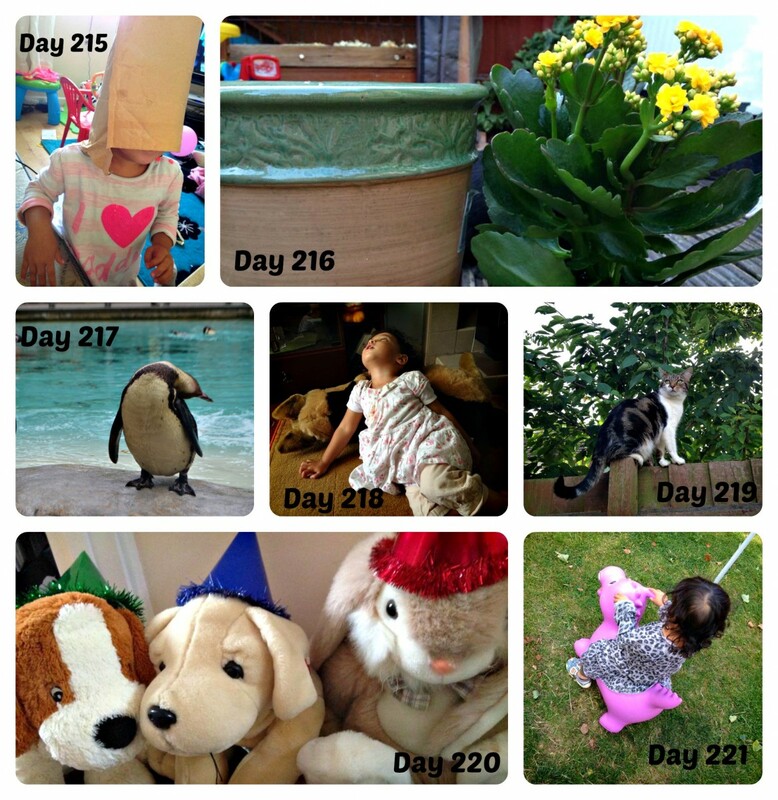 Day 217 – FINALLY went to London Zoo. You can read about it on our day out to London Zoo post. Day 219 – Day mainly spent in the garden. Rosie decided to sit on the fence and try to terrorize the neighbours dog and the birds. Day 220 – The girls had a teddy bear party! Day 221 – Bee loves her happy hopperz she got as an Eid present but hasn’t quite got the hang of bouncing and moving forward yet! good grief must have been some day out to tire Bee!!! had to laugh at the envelope on her head – this is more the Bee I expect to see. Envelopes are the very best headware around, didn’t you know that? Were the teddies celebrating Eid too? Very sweet. A lazy day for Bee, that’s not usual! Surely you all enjoyed the rest you got. Love the teddy bear party! Kids have such a great imagination!